In April of 2008, CUESA launched a Waste Wise Farmers’ Market initiative. The goal was to reduce the Ferry Plaza Farmers Market’s environmental impact by ensuring that the majority of the waste discarded at the market was be composted and recycled. From toys to phones to food and water, almost everything we purchase is encased, presented, or carried away in plastic or another packaging material. Both before and after it is used, this packaging has a significant impact on our environment. According to a US EPA statistic from 2005, 31.2% of municipal waste is generated from packaging. A good portion of this goes to the landfill; the rest is incinerated, recycled, or ends up littering our oceans and cities. Packaging also takes energy and natural resources to produce. Writes Daniel Imhoff in his book Paper or Plastic, “The downstream issues of collection, recycling, landfilling, and incinerating, while consequential, are dwarfed by the ‘upstream’ consequences of packaging production.” The production of packaging requires energy and natural resources like wood, metals, minerals and crude oil. Tree-harvesting, ore-mining and oil-drilling all have significant environmental impacts, including habitat degradation and pollution. Recycling has a HUGE positive impact on the environment, because it takes fewer resources (like energy and water) to reprocess materials than to create them from scratch. For example, recycling an aluminum can takes 95% less energy than making an aluminum can from scratch. Reprocessing also reduces greenhouse gas emissions. The city of San Francisco is on the forefront of reducing packaging waste. In 2007, the city initiated a ban on plastic carrying bags in large supermarkets. And the city’s latest announcement is a major boon for the environment: starting on Earth Day 2008, all non-compostable, rigid plastics will be accepted for recycling in the blue bins as well (only some rigid plastics are currently accepted). The city is making it increasingly easier to recycle and compost, which will help San Francisco meet its goal of diverting 75% percent of discarded materials from the landfill by 2010 and reaching zero waste by 2020. Every week at the Ferry Plaza Farmers Market, we see inspiring examples of both sellers and shoppers seeking to reduce their environmental impact. 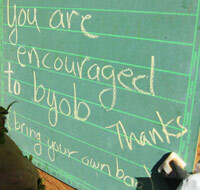 Many sellers offer returnable or compostable packaging and encourage customers to “BYOB” (bring your own bag), as shown in this sign at the Tierra Vegetables stall. Waste-wise shoppers carry their own reusable tote bags, coffee cups, water bottles, and even spoons and plates. Still, we have a long way to go towards zero waste. Before the Waste Wise program, more than one million plastic bags were distributed annually at the Ferry Plaza Farmers Market. At our information booth and at other events, 4,800 plastic bottles of water were consumed annually, most of which were used once and discarded. Until now, almost all materials discarded at the market (98% of which are recyclable or compostable) were wasted. 1. Bring your own bags, containers, water bottle, coffee cup, plate and cutlery. While recycling saves energy and resources, reducing your consumption of packaging has even greater benefits. 2. Don’t take a plastic bag if you don’t need one. If every San Francisco resident reduced their plastic bag intake by just one bag a week, we would save 38,690,132 plastic bags per year, and all the resources and energy required to produce them. 3. Reuse plastic bags and food containers. 4. Recycle recyclables and compost compostables. Use the Waste Wise stations at the market, and get know what your municipality accepts for recycling and composting so that you can properly sort what you discard at home. 5. Buy products with recycled content. If there’s no market for products that make use of recycled materials, there will be little incentive for reprocessors to accept our recyclables. According to EPA calculations, recycling and composting in 2006 saved the energy equivalent of more than 10 billion gallons of gasoline! Recycling one glass bottle saves enough energy to power a light bulb for four hours. The greenhouse gases eliminated by recycling 7 million tons of metal is equivalent to removing 5 million cars from the road for one year! Recycling and reuse helps our economy! Currently, the recycling and reuse industries provide over 1.1 million jobs in the US and gross over $236 billion in revenues per year. Click the links below to find out what’s recyclable and compostable in your community.